A house has been destroyed in a suspected arson attack in Newtownabbey, County Antrim. The fire in Birchmount, in the Mossley area, on Saturday also damaged another house. The fire also damaged an electricity substation leaving people living nearby without power. Northern Ireland Electricity said 50 customers were left without power in the area. 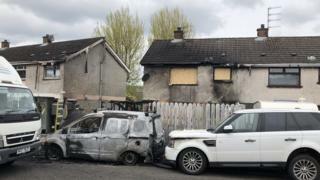 The Northern Ireland Fire and Rescue Service (NIFRS) reported the fire to the PSNI at about 14:00 BST. The Fire Service believes that a recycling bin to the rear of the houses was set alight before spreading to two oil tanks and the homes.